1) Damage benefits are applied before any talents or buffs. 2) Healing benefits are applied after any talents of buffs. 3) Bonus Healing does not apply to bandages, potions. Cast time longer than 3.5 seconds is capped at 100%. Examples: Healing Touch, Greater Heal, Shadow Bolt. There is a 100% cap on over-time spells longer than 15 seconds. The total bonus is divided equally to each tick. Same as Standard spell mechanic (cast time / 3.5), capped at 100% bonus. Since all channeled spells are longer than 3.5 sec, all channeled spells receive 100% bonus. The total bonus is divided equally into each tick. Area of Effect spells receive only 1/3 of the total bonus. The cast time is used as with a standard spell. Examples: Tranquility, Arcane Explosion, Prayer of Healing. Any spell learned below level 20 receives a penalty. If such a spell has a shorter cast time than a higher rank, this is also taken in to account. This penalty can be calculated by subtracting 3.75% for each level lower than 20. Spells with additional effects (f.e. slow) get a 5% penalty to damage and healing bonuses. This penalty is applied after the spell type calculation, before other penalties. Examples: Entangling Roots, Blast Wave. These spells have a 50% penalty to the bonus they receive. Spell damage increases both damage and healing of the spell. Bonus healing does not affect these spells. Examples: Death Coil, Drain Life. Pyroblast was changed in patch 1.9 to deal 100% of +spell damage on impact and 71.4% of +spell damage to it's DoT component. Fireball has a small damage over time component, but is not considered a hybrid spell, so it receives only the Direct Damage bonus to its direct damage component. Spell damage gear never increases the DoT on fireball. Data taken from TheoryCraft addon for version 1.12.1, then edited and fixed according to the formulas above. DoT longer than 15 sec is calculated as 15sec duration. Channeled or cast spell longer than 3.5sec is calculated as 3.5 cast spell. These coefficients are before talents and gear improvements! 2/2 improved sw ain = adds 2 ticks. Bonus is the same. 8 ticks = 16.66%/tick. 8 ticks > 6 ticks = more damage done. Fireball = 3.5sec cast = 100% bonus. 5/5 Improved Fireball = 3.0sec cast. Bonus is the same. 100% bonus. 3.0 sec cast is faster than 3.5 sec cast = faster fireball cast = more damage done. - Ice Barrier and Power Word: Shield 10% bonus from spelldmg confirmed, bonus was added in patch 1.10. - Some calculation info found for paladin Seals (link), removed TBC info, used corresponding values. - No calculation info found for Consecration. But TC, wowwiki spells and wowwiki paladin pages all use the same number. - Amount of mana burned by manaburn is unaffected by spell damage. Damage comes from the amount of mana burned, thus mana burn gains 0% from spell damage. Debuffs that increase shadow damage taken by target still increase total damage done by mana burn. - Wyvern sting confirmed both from wowwiki historical pages and hunter.wikispaces guides. Serpent sting had coeff, why not wyvern? Mend Pet bonus is a proven fact (see hunter solo Azuregos). - Info about Healing Stream, Magma and Fire Nova totem was found on the elitistjerks discussion (link) from betatesting of patch 1.12. - Lightning Shield remains unconfirmed - different values from addon, wiki and other pages, no match. 100% is based on the Shadowguard spell. - Regrowth remains unconfirmed - used calculated values. First information about Regrowth being a special case come from TBC era. Int per Crit @ 60 taken from TheoryCraft addon for our patch. Spell critical strikes deal 150% normal damage without talents. Your spell critical chance is not reduced when attacking a higher level NPC (boss). The base chance to hit is based on level difference between caster and target, starting at 96% for even levels, and going up or down from there, capping at a maximum 99%. Furthermore, the chance to hit is different for mobs (PvE) and player (PvP) targets. This chance is often named as the "First roll" and you can increase your chance to hit with spells with your talents and gear OR reduce your enemy's chance to resist your spells. Level 60 Shadow Priest attacking a boss (Level 63) with Mind Blast would have 17% chance to miss the spell. Level 60 Shadow Priest attacking a boss (Level 63) with Mind Blast with talented 5/5 Shadow Focus (-10% enemy chance to resist shadow spells) would have 7% to miss the spell. Note: When you miss, you will always see the "Resist" message in combat, there is no "Miss" with spells on our patch. You won't know if your spell was "Resisted" because of miss, or because the enemy resisted 100% of your spell effect. Binary - spells can only Hit or be Fully Resisted. Examples: Polymorph, Fear, Detect Magic. Non-Binary - spells that deal damage. Examples: Smite, Corruption, Arcane Explosion. 1) Directly reduces the chance that a binary spell will land on the target. Example: caster with 6% chance to spell hit, attacking a boss (83% base chance). Boss has enough resistance to reduce incoming spell damage by 50%. Average Resistance can never go above 75%. Most boss level mobs have 150 resistances to all spell schools, some may have higher resistances or be immune depending on the type (Ragnaros, immune to fire). Average resistance of 75% means you have a very good chance of resisting 75% of damage, also a fair chance to fully resist damage (100%), a smaller chance to resist 50% of damage, and low chances to resist only 25% or 0% damage. Example: Level 60 player has 96% chance to land a spell against Level 60 monster, that has 180 fire resistance. Player casts a Fire damage spell (Fireball). Max effective resistance to any kind of magic school is 315, and that is vs. a boss (or lvl 63 npc). Resistances can be reduced by items (Rune of Perfection) and talents (Arcane Subtlety) with Spell Penetration. Passive skill of all players and mobs that causes you to completely avoid a melee attack. Players cannot dodge attacks from behind, mobs however can dodge attacks from behind. All melee attacks and most special physical attacks can be dodged. Passive skill of most melee classes and most mobs that causes you to completely avoid a melee attack. Only melee attacks and most physical special attacks from the front can be parried. You cannot Parry ranged attacks and spells. If a warrior's special attack (Heroic Strike, Mortal Strike, ..) is parried, he does not lose rage for the spell used. All classes must learn Parry from their class trainer or via talents (Shaman). Mage, Druid, Priest and Warlock can't parry. After a successful parry, the defender's "swing timer" is reduced by 40% of his weapon speed, but never below 20% of your swing time remaining. so your swing timer remaining is reduced: 1 - 0.8 = 0.2sec before you attack again. Example2: You have 2.00 weapon speed. There is 0.5 seconds remaining before you attack again, and you parry enemy's attack. Again your remaining time would be reduced by 0.8, which means you would attack instantly. So instead of attacking back instantly after parry, it will still take 0.1 seconds before you attack your enemy. Block is the ability of a shield to absorb melee damage. When a Block occurs, you are affected by the damage of a normal hit reduced by the amount of blocked damage. There are only 2 modifiers, and those are Paladin and Shaman Shield Specialization talents, that give a % bonus. Enemy hits you for 200 damage, your armor and Defensive Stance reduces the damage to 100, and you block 40 damage, so you lose 60 hit points and combat log shows "... hits you for 60. (40 blocked)". All these chances are affected by your weapon skill and your target's defense skill. Since NPCs defense skill and attack skill is always (level * 5), their level affects all the chances. Druids in beast forms also get a weapon skill equal to their (level * 5), but the defense skill used is their real one. Player attack can Hit, Crit, Miss, be Dodged, be Parried, be Blocked and be a Glancing Blow. NPC attack can Hit, Crit, Miss, be Dodged, be Parried, be Blocked and be a Crushing Blow. The game selects what happens everytime you attack with a single choice from the Attack Table. You have a warrior with maxed defense skill. Your enemy is equal level and attacking you, this is his attack table. The game makes a single roll that determines the outcome of enemy's attack. The same table is used for every melee attack. Hit means the target suffers damage. Miss means no hit, no damage is done. Critical hit means that you deal 2x normal hit damage. * Crushing Blows can only happen when mob attacks player with lower level or defense skill. Crushing Blow will be described in the next part. ** Glancing Blows can only happen when mob is attacked by player with lower level or weapon skill. Glancing Blow will be described in the next part. You can check different possible outcomes of the attack table on wowwiki. Tank = a player who wants the enemy to attack him and not the others. Mobs in WoW are guided by "threat" system. Every player in combat has a threat rank, and mob will always try to attack the player highest on the threat rank (player with highest threat). In order to tank properly, the tank must generate enough threat (aggro) to keep the enemy attacking him. He must also attain enough Hit Points to be able to withstand the attacks and/or enough Avoidance (Dodge, Parry, Block, to be Missed), to reduce the damage that he has to take. 1 point of Defense skill = +0.04% to be Missed, to Dodge, to Parry and to Block an enemy attack. It also decreases the attacker's chance to Crit by 0.04%. That means, +25 Defense skill = +1% to be Missed, to Dodge, Parry, Block an enemy attack, -1% to be Critically hit by an enemy. By far, defense is the best stat any tank can get. A level 60 player needs 425 Defense to be Crit immune versus a level 60 mob. A level 60 player needs 440 Defense to be Crit immune versus a raid boss. Crushing Blows can happen if a mob attacks a player with base defense skill lower than level * 5. Crushing Blow deals 1.5x base damage. Only base defense is taken into account to determine the chance for a Crushing Blow, +Defense from gear does not count. Every point of defense skill missing will increase the mob's chance for a crushing blow by 2%. Example: a level 60 warrior has 297 Defense skill, and he's fighting a level 60 mob. The mob's attack skill is 60 * 5 = 300, so the mob has 6% chance to make a Crushing Blow on our warrior. The only way to reduce chance of Crushing Blow is to gain combined chances to be missed, to dodge, to parry, and to block that high, that the Crushing Blow chance is pushed off the bottom end of your attacker's Attack Table. Against a Raid Boss, all combined avoidance must add up to 102.4% to remove Crushing Blow from the Attack Table. In a similar way to Defense, 1 point of Weapon skill will increase your chance to hit, crit and decrease the chance that your attack will be a glancing blow or that the target will dodge, parry, block your attack by 0.04%. What weapon skill is used is dependant on the respective weapon type you are currently using. Fist weapons and attacking with no weapon (or while disarmed) uses the Unarmed skill. Glancing Blow is a type of hit that deals reduced damage and cannot crit. Glancing Blows can be only white melee auto-attacks, special melee attacks and procs (Mortal Strike, Backstab, Seal of Command, ..) cannot be Glancing Blows. Glancing blows do not occur against players, only against mobs. The chance to perform a Glancing Blow is different for "melee" classes and for "non-melee" classes. Non-melee classes - Hunter, Shaman, Priest, Warlock, Mage, Druid in human, Travel, Aquatic and Moonkin form - have flat 60% chance to do Glancing Blows. Base weapon skill is used, so you cannot get rid of glancing blows. Level 60 melee class will have 10% chance of glancing blows against a level 60 mob. Level 60 melee class will have 30% chance of glancing blows against a level 62 mob. Level 60 melee class will have 40% chance of glancing blows against a level 63 mob (raidboss). Level 60 caster class will always have 60% chance of glancing blows against ANY level mob. Damage reduction of glancing blows varies based on the mob level and your weapon skill. The damage reduction will be chosen as a random number value between low-end and high-end values for each attack. The low-end value will never go below 0.01 or above 1.0. The high-end will never go below 0.2 or above 1.0. You are a warrior, you have 300 weapon skill, you're attacking a level 63 boss. 10% + (315 - 300) * 2% = 40% chance for glancing blow. So you have a 40% chance of glancing blows vs. level 63 mob. So for our example warrior, your glancing blows against the boss will deal 35% less damage on average. Current weapon skill is used, so you can decrease the damage reduction by raising your weapon skill from spells and items. With enough +weapon skill, all your glancing blows will hit just as hard as your normal hits. Extra attacks are gained from talents or item chance on hit bonuses (Flurry Axe). The shaman ability Windfury also adds Extra Attacks. Any extra attack is treated as a separate normal auto-attack hit - it can miss, be dodged, parried, blocked, be a hit, a crit or a glancing blow (if attacking a mob). Special attacks are usually seen as "Yellow numbers". These include abilities like Heroic Strike, Backstab, Seal of Command, Stormstrike, ... and physical proc abilities like Decapitate from Halberd of Smiting. They can miss, be dodged, parried, blocked, be a hit, a crit. Special attacks cannot be Glancing Blows or Crushing Blows. The mechanic for resolving Special attacks is not properly documented. However it has been proven, that special attacks like Heroic Strike can be blocked and be a Crit at the same time (Blocked Critical hit). A guy from Elitistjerks made a series of tests with Backstab, and came to conclusion that his critical hits with backstab are consistent => that would indicate the use of a two-roll system, same as spells. Example: We have 2 level 60 warriors, both have maxed defense and weapon skills. Warrior A charges and attacks B with a Heroic Strike. As Warrior B is stunned from the Charge effect, he cannot Dodge, Parry or Block. Our warriors have both 15% chance to crit. As explained above in the spells part, having a separate crit roll makes your crit rate more consistent and on average you would deal more critical hits. Magic damage auto-attacks (for example, autoattack of a Fire Elemental deals fire damage) are also following the attack table rules, so you can Dodge, Parry them, they can Miss, but they cannot be Blocked. In addition to the normal roll, hits, crushing blows and critical hits are also reduced by your corresponding magic Resistances (see above). Magic damage melee special-attack (Seal of Command) are resolved in the same way as melee physical attacks. You can dodge, parry, block them, they can miss and be Critical hits. In addition, a resistance check is made with the corresponding resistance, same as with magic damage autoattacks. - It is possible that two players hit themselves simultaneously, both at exactly the same time. Thus, it is possible that both players die in the same moment or disable each other from combat with stuns or other CC. - It is also possible that two players hit themselves with spells that cannot be applied together on one player (for example a mage's Frostbolt can actually slow a paladin that uses Blessing of Freedom at the same moment the spell lands). On our patch, all Crowd Control (also called CC/Disable) effects used on players give the player a chance to break free of that effect. This chance increases every second and ultimately reaches 100% when any CC effect reaches 15 second duration. Even though you will see the full duration of a debuff displayed (for example, Polymorph will show you 60 seconds debuff), enemy player's CC effect can NEVER last over 15 seconds. Using different effects from other players together will not prolong this duration. For example, if a Mage uses Polymorph on an enemy player, and in 8th second a Warlock uses Fear on the same target, both Fear and Polymorph will be broken once the enemy player's check to break free passes. On our patch, all Crowd Control effects used on players are also subject to "diminishing returns". In a player versus NPC battle, you can repeatedly use CC effects (for example Polymorph) to keep an enemy out of combat and attend to other NPCs. But in PvP, this is severely limited, as repeated use of any form of CC will keep lowering the duration of this CC effect. First cast of your CC effect will for the full duration. Second cast of your CC effect will be limited to 1/2 duration. Third cast of your CC effect will be limited to 1/4 duration. Fourth cast will not cause anything, and the enemy will respond with "immune". 4th cast - the enemy will be immune. This period of diminishing return will always last for 15 seconds. That means, if our Warlock casts four Fears, then he has to wait 15 seconds until his Fear will become effective again. In the same way, if our Warlock casts only one Fear and then keeps running away from the enemy player, and uses another Fear after another 15 seconds, it will last for the full duration again. Root - Frost Nova, Entangling Roots, Nature's Grasp, Frost Shock (exception) and other root effects (Gnomish Net-o-Matic). Stun - Bash, Concussion Blow, Charge, Inferno, Hammer of Justice, Intercept, Intimidation, Kidney Shot, War Stomp and other active stun effects (Tidal Charm). Random Stun - Blackout, Impact, Improved Starfire, Improved Concussive Shot, Mace Spec, Pyroclasm, Improved Revenge, Seal of Justice and other effects from Chance on Hit: Stun. Sleep/Disorient - Freezing Trap, Hibernate, Polymorph, Wyvern Sting, Blind, Scatter Shot and other Sleep or Disorient effects (Magic Dust). For example, a priest's Blackout stun would not reduce the duration of a Rogue's Kidney Shot. But the stun effect from a Warrior's Charge would reduce the duration of a Rogue's Kidney Shot. Found several references to lightning shield getting a 80% bonus overall resulting in a 26,67% damage bonus per charge. Also the heartbeat mechanic here seems to be wrong. Still scrolling the patchnotes that state the correct behavior. I'll look thorugh it and compare to the numbers I've got and see if there are some differences. Ill start with the Int per crit @ 60. I see that you are using TC as a source here which, from what I've seen/read, is wrong. This is a copy from my post I did 6 months ago. At level 60, each class has an "expected amount" of INT. This varies from class to class. At level 60, a Mage's expected amount of INT is 286 points. That expected amount yields a 5% crit chance. This works out to 59.5 points of INT for each Crit% point. At levels before 60, the numbers are different, but keep the basic ratio of expected amount of INT to the crit% of 5. Sorry that I don't have the exact numbers for Paladins, but the trend is illustrated. So, according the TBC revision Paladins got 106 expected Int at 60 and a int/crit ratio of 54. Since this is taken from wowwiki (unreliable source) and from a TBC revision these numbers needs to be tested before we can decide whether they are correct or not for pre-tbc. Luckily there are a lot of Paladin crit tests posted on the internetz so we got plenty of numbers to work with. Due to the close trend lines I do think the wowwiki numbers for Paladins, 54 Int/crit, 106 int at lvl 60 are correct. This will give the Paladins a 3% base crit (5-106/54=3,03). When it comes to the Shaman - Priest swap I do think the wowwiki numbers are wrong. A post made by a blizzard employee should outweigh a wowwiki member. Furthermore, all Tiers/dungeon set gives more Int to the Priests than to the "hybrid class" Shamans. Feel free to prove me wrong, this is just my hypothesis. These are the actual int/crit ratios u get in-game. For example: if you got 282 Int as a shaman and casts 100k casts u will get a crit rate of 282/59,2+2,3=7,06. which gives an actual int/crit ratio of 282/7,06=39,9. I.e the int/crit ratio increases as you get more int becuase the base crit becomes smaller in comparison to the crit you get from the Int. Glancing Blows - what are they? Purple haired gibbons from under the sea. Seriously. So versus a 63 mob your strikes do 70% (85% versus 62) when they glance. Easy to solve - just get more Weapon skill. For your white strikes 10 Weapon Skill means your glancing blows deal full damage. That's _exactly_ the same as +12 Hit has once you are beyond mitigating yellow strike misses (and aren't beyond the '29 more crit' limit). Because you can get glancing blows to deal full damage. No matter where you got that information from, its just wrong. You could get it up cloe to 100% with enough +wep skill, but never the full 100. Okay lets put it this way. Considering bosses have 315 defense, the +skill cap will be 315. Since going from 310 to 315 will not give you any significant increase in glancing damage anymore people just left it at about 310~. You'd had to sacrifice way better stats to go the other +5 for 310 so it just wasn't worth it. Glancing over 100% damage according to your source? Nope sir, I am sorry. Again,  on the first couple paragraphs of what you just said (other than bosses having 315 defense of course, everyone is aware of that). I am also not trying to argue that glancing damage >100% is possible, I am saying that with people getting results that make them suspect that it's possible to go beyond 100%, the wowwiki formula falls short of getting anywhere close to being able to explain that as it caps out at an average of 95% of normal white damage. It goes as far as stating that there is a damage range for glancing blows with the bottom end never exceeding 91% of white damage which contradicts the damage numbers observed by that one guy on the official forums. Now you might wonder, why am I arguing against wowwiki again when you said that you aren't trying to defend wowwiki? Well, the 70%+3% per point of weapon skill above 300 formula and the wowwiki formula are the only ones you are going to find mentioned anywhere. Feel free to create the new amazing Lharts glancing damage formula, but I'm afraid to tell you that you probably won't convince anyone that it's correct. We'll have to go with what we have evidence for and so far everything other than the weapon skill wowwiki article is speaking in favor of the commonly accepted 70%+3% per point formula. The wowwiki article was written by no other than Beaza, a guy who was accused of vandalizing wowwiki even back in 2006 after editing various combat mechanics related articles in a ridiculous fashion, making them say things not mentioned in even a single other source without ever coming up with an explanation for any of them. I'm not buying it and I don't see the point of arguing over this with someone who has yet to provide any source other than his personal opinion. You accuse me of "just" giving my personal opinion when all you posted was a 3rd parties personal opinion? Thats makes sense beyond believe. I can only tell you what I observed when I theorycrafted myself at 60. They never dealt 100% of the damage. Like it or not. In your case, not. Well, it's either a whole bunch or third party people from 2006 who argue based on test data or a single third party person (you) who is currently trying very hard to convince everyone that the other third party people are wrong based on memories of 8-9 year old test data he is unable to show (I'll go ahead and make the assumption that you don't have access to the numbers you supposedly theorycrafted yourself at 60 as you would have probably posted them already). You can go ahead and tell me which is the two is going to look more convincing to developers because what matters here isn't that either of us goes out of this discussion admitting that he was wrong, what matters is the formula the server ends up running. wow, hold your horses please. You post a source of a single rogue who doens't even bother to write proper english and furthermore give wrong numbers in the comments following his post. See the (also empiric) numbers from the posts. Its capped on the low end... Glancings can never deal 0 damage. Why is it hard to believe there was a cap at maximum damage? Those additional 5% to 0 would take you 5 more +wep skill. 40% chance on glancings to occur vs. bosses. Those additional +5 would remove 5% * 0.4 reduction giving you 2% more whit damage. 2% just from those additional 5+ is good, right? Why was is commonly accepted that 310 was soft cap and any further point would only slight increase your damage gained making more then 310 not at all reasonable? You got 3 different forumlas in 1 wiki page. Your article states something else again. Since you can't provide any reliable source what do you really want to get from this thread now? NOTE: I am not trying to disprove what you said (then again, I don't have to), nor am I trying to get a hard cap implemented (only cause I believe it was this way) since I can't provide RELIABLE source on the real mechanic. The solution with 70% damage done by glancing blows + 3% per weapon skill, capping at 310 and 0% reduction is simpler, and just because its more simple its a better solution till proven wrong. @callre: maybe I'm missing something, but your trend lines calculated from the TEST results never go even close to 54 int per 1% crit. They are much closer to the 29.5 from theorycraft. The weapon you tested with also matters, because of their different min/max damage values. Because every hit you do is a random between those values, you should be testing while you are unarmed for best results. Also, the glancing blow itself is a random between two values aswell, so hitting with 100% damage is basically hitting "/roll" 100 two times in a row. Even with 310+ weapon skill with the testing, you might still not hit for your max damage, because of the weapon damage range. Test with worn dagger, but never unarmed. No idea what exactly he is trying to show with the trend lines but here is my take on paladin spell crit. From http://blue.cardplace.com/cache/wow-mage/1009382.htm we can derive that there is an expected amount of int at 60 for each class. When a class is at their expected amount of int, they have 5% spell crit. 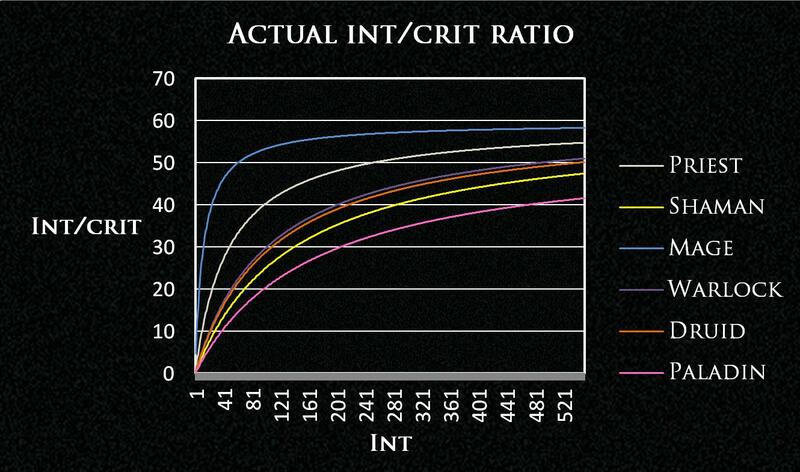 In the case of mages, the expected amount of int is 286 while the amount of int required for 1% spell crit is 59.5, leaving the need for 5%-(286/59.5)/100=0.1933% base spell crit. Note that this implicitly disproves the 29.5 int per crit value for paladins already as it was calculated under the assumption that paladins have 0% base spell crit which would require their expected int to be 5*29.5=147.5. If that was the case, we should see nearly exactly 5% spell crit on tests where a value near 147.5 int was used. Well, we don't. Adding up all 153 int tests from http://www.wowwiki.com/User:Pauladin/Paladin_spell_critical_rates leaves us at 7.06% crit (6.06% after modification, more on that in a bit) when the 29.5 variant would only expect 5%+(153-147.5)/29.5/100=5.186% crit here. With a sample size of 12669 casts at 153 int, that's a difference I'm not comfortable with blaming RNG for. Before moving on to the data to figure out what the spell crit chance should actually be, I'd like to comment on some of it. I am fairly confident that while swapping int items, +spell crit items were sometimes added. Alright then, let's get started here. First, let's look at some numbers. Going from 77 to 279 int increased his observed crit by 3.303%, suggesting a int per spell crit value of 202/3.303=61.16. The change from 77 to 153 leaves us at 76/1.534828=49.517. We can also attempt to derive a value for expected int at 60 from these values. The latter would leave us with 49.517*(5-6.06+153/49.517)=100.512 while the former would leave us at 61.16*(5-7.833+279/61.16)=105.733. A value that just so happens to be pretty close to that is the wowwiki one that popped up on their attributes article sometime in TBC (http://www.wowwiki.com/Attributes?diff=next&oldid=991065) indicating that paladins have 106 expected crit at 60. The only qualms I have with that is that I am unable to find the source of that number but considering that it fits the calculated expected int values well and someone must have put it there for a reason, I'll roll with it. Now that we have an expected int value on our hands, let's figure out a int per crit value that does a decent job at explaining the observed values. I'll include 29.5 + 0% base crit as well, but it's pretty unlikely to be true from what we've seen so far already anyway. 54 int per crit (as suggested by TBC wowwiki) and 60 int per crit (similarly to other classes in vanilla) both do a really good job, I'd say 60 int per crit does the best job with the only significant variance being a 0.28% difference in calculated and observed crit on the 153 int test which is a test that most likely had a slightly higher result than expected anyway judging by the fact that the observed crit is higher than in the test with 155 int. As expected, the 0% base + 29.5 int per crit formula performs pretty terribly as it is a terrible formula made by silly people. Note that the 54 and 60 int values both include base crit derived from the 106 expected int at 60 value, 5%-(106/54)/100=3.037% base crit for 54 int per crit and 5%-(106/60)/100=3.233% base crit for 60 int per crit. I am honestly not surprised that 60 int per crit explains the results best seeing as every single class we have the official int per crit numbers for is somewhere between 59.2 and 60.6 int per crit, there really isn't any reason for paladins to be any different. Don't have time to read all the numbers yet, I'll see them in the evening. This page approves of the 29,5 formula and leads to a post on the EU paladin forums, however that page is not archived. With a quick glance on the Pally forum, I found this topic, where the author refers to some "EU test" with 30 int per crit number. @ Lharts: why not unarmed? Like Lharts mentioned, the test referred to is Talshuler's int research. Note that his numbers were actually included in the test above, one was discarded due to being a 1000 sample size test and his 2787 casts test at 214 int was included (see http://web.archive.org/web/20061108204558/http://www.wowwiki.com/Talshuler's_Int_Research ). Both 60 and 54 int did a better job explaining his 214 int result. As for the unarmed question, I'll throw the question right back at you, why unarmed? With a 1-2 damage weapon you can get 2 different damage numbers per combat event (hit, crit, etc.). This is important beause you know exactly which base weapon damage is being used right now. Wanna see if your crit damage modifier works correctly? Easy, just compare the lower of the two hit damage numbers you can get with the lower of the two crit damage numbers you can get (or the other way around). Want to test some sort of damage modifier (for example +10% damage from a darkmoon faire buff)? Easy, remember either the higher or the lower of the two damage numbers, apply the buff, check what it turned into. Want to test some damage formula that uses weapon damage? Just go calculate the expected result and compare it to what you see ingame, knowing the exact weapon damage used allows you to do that. For ranged attacks its the same deal, they even have a weapon with 29-29 damage (fine light crossbow) so only one damage value is possible. With the Zandalar buff and gear I had 293 Int. I've got 5 points in Holy Power => +5% crit on holy spells. I also got +2% crit through gear. 106 Int expected at lvl 60. The expected amount should grant you somewhat arround 5% crit at level 60. So now we have 3 values without the expected crit chance at lvl 60 (-106 = ~5%). According to Dhorns research and also the thread I posted, the 29.5 formula is wrong.